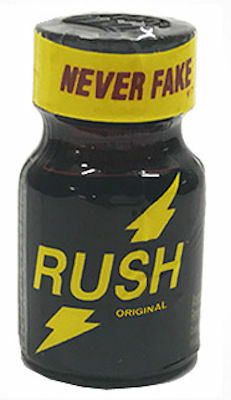 PWD RUSH is a solvent cleaner and the most popular brand in the world, Now back in the famous Black Label. Easy to handle 10ml bottle. Resalable Polycone cap prevents leakage and maintains freshness. Power Pak Pellets (PPP) maintain exceptional purity & potency for longer periods. This product contains isobutyl nitrite CAS 542-56-3 / UN2351 and is manufactured, labeled, marketed, and sold for use as a specialty commercial solvent cleaner in compliance with 15 U.S. Code § 2057a. Label information provided by the manufacturer. As with all products carefully read the product label prior to use. Highly flammable. Keep away from heat, sparks or flame. Contains isobutyl nitrite CAS 542-56-3 / UN2351. For use as a cleaner, dip a cotton swab in solvent and apply to area to be cleaned. Do not use on styrene or similar plastics or damage may occur. Store tightly sealed in a 32-38 degree environment. Use at room temperature.